As spring has arrived we decided to take a grand "ballade," (hike) from Vers to the Pont du Gard 2 km away. Through the trails, past ruins of the roman acqueduc, the magical herb garden, olive orchard and garrigue (forest with low trees and bushes) we arrived at the Pont du Gard. Pantoufle and Zoe-Pascale ran, danced, skipped and sang the whole way there and back loving the bright sunshine and hidden secrets of the garrigue. 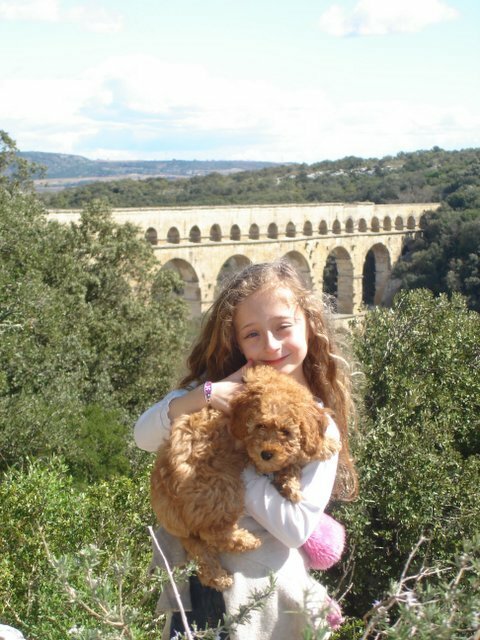 The Pont du Gard was part of the 50km aqueduct built over 15 years by the Romans in the first century A.D. Its purpose was to bring water from the source of Eure in Uzes, to the growing town of Nimes. The Pont du Gard consisted of three layers of gigantic yellow limestone boulders. The bottom row forming six perfect arches stretched across the river and supported the second level with 11 smaller arches and 47 even smaller arches on the third and top row. Each boulder was placed neatly into a semicircle, framing the river below and held together with the pure force of the stones pressing against each other; truly an architectural marvel. It was hard to imagine how the Romans were able to build this tremendous aqueduct with no mortar or concrete, but with absolute precision, pure engineering talent and a great deal of muscle. It was so perfectly constructed that the flow of water from Uzes to Nimes, took 28 hours over 50 km at an average speed of 1 meter a second.We recently read that the Pont du Gard is the second highest structure the Romans built with the first being the Coliseum in Rome.